It was midwinter, in January, when mother received a telegram from father who had gone off in search of more horses to satisfy the need of his customers. The telegram instructed her to have Roy and Gordon (my older brother and I) drive Fly (a standard bred mare) with the cutter to Portage la Prairie to meet him at the Northern Pacific stockyards where he was to arrive the next day with several cars of horsesninety-six head in all. We set out immediately with our fast trotting mare and cozily wrapped in fur robes. We spent the night at the Davey Hotel in Westbourne, twenty miles from Gladstone and about half-way to our destination. We arrived in Portage la Prairie the next forenoon and father had already arrived by train with his horses and was busy unloading them into a corral. Of the ninety-six horses, ninety-two were wild unbroken broncos he had purchased in Montana. There were three broken saddle horses and one big grey Percheron stallion that had been imported from France to raise the physical standard of the horses on the range. By instruction we had brought along three saddles, blankets and bridles with a halter bridle and long lead rein for the stallion. He had also brought with him to help with the horses a cowboy from the Montana ranch. The plan was to have father in the cutter start out leading the stallion from the corral gate and as the horses inherently usually follow the leader, they would string out from the corral behind father and the gray stallion with Roy on the right and I riding on the left flank, our cowboy, Ed, on a third saddle horse, bringing up the rear. The N.P. Stockyards in Portage la Prairie are in the east part of the city and as our trail was westward the line of horses strung out proceeded west along the wide main street originally part of the Fort Garry-Edmonton trail. Everything was going along nicely, with the whole band of horses in easy travelling formation, but as we got towards the western part of the city a bunch of barking dogs came yelping at the midsection of our horse line from the south. One thing range broncos do not like is wolf-packs and as the barking dogs came up, the centre horses broke to the right in a northerly direction and led the others in a stampede through barbed wire fences over the railroads and across country. I can still see the picture of the formation as the stampede developed, the centre horse leading and the front and rear horses following. As the front horses joined in the run, the big gray stallion made a valiant effort to follow them. Father hung on to the lead rein, the cutter upset, and the stallion dragged father through the snow several rods before he was able to control him. We on horseback followed the stampeding band but they had covered several miles through barbwire fenced farms before we were able to head them off. Several of the horses were badly cut by the barbwire but only one was so badly mutilated that cowboy Ed took out his revolver and shot her. We then drove the subdued band westward to Westbourne where we met father in his cutter with big Gray firmly in tow. These rangebred horses were not familiar with wire fences and it took them some time to learn to respect them. On another occasion a herd of thirty broncos stampeded from the pasture northwest of the farm. They kept running east and into the big Grass Marsh which was six to eight miles wide. We lost them there and it was six days before they stumbled back to dry land. One horse was missing, presumably mired in the muskeg. Over the years when I was quite young, my father had brought in many famous stallions. His philosophy was that to bring up the standard of your stock, you must have the right sires and to make sure that the mares were bred to them only, he gelded his colts when quite young. The first of his many purchases was a beautiful Clydesdale stallion imported from Scotland. My most vivid recollection of him was when as a child five years of age I saw my father lead him out of a burning horse barn, the other horses from the burning shed and barn following. My father had just rushed in from the field to find that a hired man was unable to drive the horses out through the smoke-filled door. The sagacious horseman rushed in, quietly untied the big light bay white-footed, blazed-faced stallion, Camsie Lad, and led him through the smoke, the other horses following. As he said, in a burning building, horses tend to huddle in fear in their stalls or corners, but are always ready to follow their leader. Although the whole barn and shed was demolished, only one horse failed to get out. Because of the increased mobility, stamina and endurance of the Percherons he sired his herd with a succession of black or grey Percherons. When bred to bronco mares a good type of animal resulted. Lively, docile, and big and strong enough to handle the heavy farm work and smart walkers either drawing farm machinery or on the road drawing a grain wagon. About the turn of the century, my father brought home from Iowa, with a carload of harness-broken horses, a Jackass which was known as Spanish Jack. At that time, mules as beasts of burden were quite popular in the mid-western States both for their stamina and their ability to thrive on pasture and fodder which would be quite insufficient for horses. For several spring seasons, Spanish Jack travelled the country nearby servicing mares for those farmers wishing to grow mules for their farm work. Father bred a number of his mares to Spanish Jack, selling the mules as working animals as he did horses. As a young boy of fourteen years I had “Ginnie” a female mule sired by Spanish Jack in my four-horse team. At times I had a grey stallion in the team and then it was always necessary to have a horse between them. Unlike the female horse that comes in season only periodically, Ginnie always had an amorous leaning both figuratively and literally, when near a stallion. She was the ready prostitute of the “Genus Equus” and being a sterile hybrid was all the more nuisance in a band of horses. While on the subject of stallions, I would be remiss in my obligation to my father’s memory if I failed to comment on the standard bred black stallion, Harry Wilkes, that he brought home on one of his forays to Iowa for harness-broken horses. This Stallion was his pride and joy just after the turn of the century. His sire was a famous Wilkes Stallion in the middle Western states. Some of Harry’s offspring developed into the finest driving horses of which we raised several. His function as a stud, however, was secondary in my father’s thoughts to his great ability for which the Wilkes horses were notedto cover the race track between the shafts of a Sulky a little faster than his competitors. My father trained him and raced him at the various meets in Portage la Prairie, Neepawa, and Brandon, usually winning, but only once did he hang his head in shame. This was a Portage la Prairie 24th of May gala day. He always slept in the stall with his horse when at the track, as he was well aware of the danger of some disgruntled bettor arranging to drug the popular horse. On this occasion he went out to eat just before the race and when he took his horse out a little later, he was drowsy and of course unable to make a showing in the race. It takes only a few seconds to inject a drug and in those days there was not the penalties for such crimes as there are to-day. Thirty-five years ago, while on a surgical speaking tour, I stayed at a hotel in Terre Haute, Indiana, and was delighted to see in The Hunt Room, a large picture on the wall of the great Adrian Wilkes horse, father of our Harry. During the last two decades of the 19th century, and the first decade of this century, clearing the land, breaking and cultivating it together with running a large herd of cattle and an active horse-raising and sales business required a lot of help. Most of his hired men came from Europe. He applied through an agency and in some cases, paid their fare. German, Austria, and Switzerland, provided most of them with a number from the British Isles, also. Most of these, after working for a year or so and having learned to speak English, homesteaded in the country north of our farm. Many took up land east of Plumas and Tenby, also along the Grassy River and as far north as Waldersea. My father helped them to locate and let them have needed horses and helped them with their machinery. In effect he was largely responsible for colonizing that whole area. Such well-known names as Dilk, Senft, Rosnagel, Hoehn and Fingler, which one now sees on the mail boxes of many farms in that district, represent the descendants of men my father brought from Europe. The harvest excursions from Ontario and the Maritimes, also were the source of much of his help. The C.P.R. brought them out for $10.00, many of whom, after working on the farm for varying periods of time, remained in the country and established themselves in farming or some other business. The Jim Watsons of Plumas and the Jim Judds of the Portage Plains were in this class. This biography of my father’s life during the first five decades after arrival in Manitoba would not be balanced if I did not bring into the picture something at least of his family life and the family circle, which my mother and he so harmoniously built up following their marriage in 1881. In those early days, social, sanitary and health standards and customs were quite primitive as were the laws of survival. The pioneer of the west had to make his way by personal effort in order to provide himself and family with food and shelter. The family unit became the pattern of colonization and, as the communities grew and prospered, the families participated in becoming not only part of the whole, but also each, an individual sentimental and intimate family circle. Our family was no exception to this pattern and perhaps closer in intimacy and congeniality than most of the neighbors. In this movement my mother took the lead. Her kind, considerate care of, and thoughtfulness for the wellbeing of her husband and children were the foundation for the building of our happy family circle. She came to the bachelor quarters on an isolated homestead as a young bride only twenty years old, married to an energetic hustling man thirteen years her senior. This man had an urge to get things done and get on with the next job. An early riser his horses were on the move while those of others still enjoyed their comfortable stable stalls. A man of stern and intensive exterior, he had a heart of gold and compassion for others in need. This sentiment showed up to the highest degree in his consideration for his wife and family. Outside he was the boss, but in the house, as the nominal head of the family, he always deferred to my mother’s wishes and advice. When one of us children had an argument with our mother, he always took her part and firmly but not punitively, admonished us. He despised the “two-faced” people and always said”a man is just as good as his word.” In his business of running a big farm, a cattle herd, and an active horse-breeding and sales programme, he dealt intimately with many people. There were the Abattoir heads in Winnipeg who bought his cattle and who were sometimes guilty of deducting perhaps two much for shrinkage when weighing in the animals (so my father said); the railroad heads who shipped his cattle out and his horses in; and the many horse deals he made with the ordinary citizen. His sense of integrity was reflected in his confidence in others, so much so that in all the hundreds of horse sales he made, he seldom took a note even when the down payment was small or perhaps nothing. By and large his reputation as such was acknowledged throughout the country. With this dynamic man, my mother had to live and bring up her family. He might storm in a rage about some event outside the family that conflicted with his sense of fairness, but my mother in her quiet way, soon smoothed his ruffled feathers and in a short time he would again be the humorous, congenial head of the family. My mother was brought up in the Methodist faith and was a staunch supporter of her church. My father’s people were of the Lutheran denomination so it was easy for him to go along with my mother in her religious tenets. My father conformed only in spirit, rather than being at all active in promoting this side of the family circle. My mother was always the activator and my father seemed to follow along much the same as his six children, none of whom developed the urge to show leadership in this field. All of us attended Sunday service and as we entered adolescence, each in turn sang in the church choir and participated in the usual social and musical church festivities. My first memory of musical instruments in our home was of the old wind organ which my mother played only well enough to lead us in hymns and songs. My father was quite proficient on his concertino, usually in those days called an accordion. Regularly, on Sunday morning, after prayers, we as young tots gathered around the organ and to the accompaniment of my father’s concertino, we all including my parents, gave lusty voice to the renditions. My father had a good tenor voice and as we each grew up and developed our change of voice, we had as sonsone tenor, two baritones, and one bass. Of my two sisters, the eldest sang contralto, and the youngest of the family, soprano. As the old organ gave up the ghost, it was replaced by a Newcombe Piano, something quite special in those days. Typical of the unconventional events happening so often in our family, was the manner by which the piano came into our household. My father had purchased in Iowa and shipped by Northern Pacific Railway to Portage la Prairie, a carload of well-broken horses, mostly Percherons and Belgiums. The owner of the store that sold pianos was at the stockyards when my father was unloading the horses. He took a fancy to a Percheron grey mare and wanted to purchase her. My father knowing the man’s business and the deteriorating condition of the organ at home, proposed a dealwhich was a direct trade, the mare for a Newcombe Piano. This deal was consummated, the sequel of which is that the piano served in our home until my parents died, but the mare, in her new surroundings, escaped from her owner’s care and was last seen by some citizens heading south on the canter in the direction of her home, as liberated animals usually react when dislodged from their native habitat. The unfortunate owner never recovered his mare; she would probably continue south until tired and lured by the pangs of hunger, join some farmer’s horses and enrich his equine labor force. The advertisements in papers across the country for information on the straying mare were perhaps not read by the new owner, or could his sense of probity be a bit blunted by greed? In any event, the piano was a welcome acquisition to our family musical circle. My sister, Madeline, the eldest of the family was the first to profit by it in her music lessons. My sister, Marguerite, the youngest, advanced much further in proficiency at the piano. As we grew up, all the boys in turn became members of the Gladstone Band. My older brother, Roy, played the slide trombone; my younger brothers Stanley and Walter, played the baritone and tuba horns respectively, while I struggled with the trumpet. A new musical era had dawned in the family circle. The early days when as young, hungry robins about to be fed, we draped ourselves with gaping mouths in song about our parents, gave place to a resounding cacophony of noises as we strove valiantly over the months to deliver a more melodic rendition. Gradually we were able to modulate our performance so that our young sister at the piano could fit into the harmony, not to mention my father on the accordion, trying to contribute his bit. As members of the Gladstone Band, until each of us left for college in Winnipeg, we were part of a thriving musical organization. The weekly band practice was always fun and our various trips to neighboring towns to play for their fairs and gala days, were always enjoyed. The highlight of the year was our trip to the Winnipeg Exhibition where we played for the Fair. We also entered the Band Competition as did many other small bands, including some from the Northern states. We were happy on two occasions to come into the prizes. Going back to the early days on the homestead, I would like to refer to some of the challenges my parents had to meet in developing the farm and bringing up a young family. The following events stand out clearly in my mind as they occurred during my early childhood life before leaving home in 1904 to attend Wesley College, and later Medical School. The lifeblood of the farmer is his crop and in the early days, perhaps more than the present more affluent era, any failure of the crop of grain at any period of its growth brought an aura of despondency over the whole family. Even the young children seemed to sense their parents’ disappointment. The atmosphere was in contrast to the happy congenial spirit that pervaded the family circle when the crop was seeded and the June rains came along which as my father said would carry the wheat, oats and barley through to normal maturity. Failure of the midsummer rains to appear produced a stunted semi-withered grain stalk with the heads producing a shrivelled kernel, so that the crop at best was not only down in quantity but also the sample was downgraded, sometimes as low as to be serviceable only for second-grade stock feed. This crop failure was of course due to lack of sufficient rain at the right growing season. Two unexpected tragic crop disasters occurred, the first one in the mid-nineties when a hailstorm coming in early August when the wheat had just headed out, completely cut and levelled the whole crop. The second instance also before the turn of the century was a grasshopper plague. I remember well when the cloud of grasshoppers seemed to blot out the sun. The crop was ruined, very little being left that could even be salvaged for feed for the stock. Another hazard developed as rust damage began to appear. The Red Fife and the later Marquis variety were quite susceptible to this organism which greatly reduced the grade and yield. Research work by agronomists of the Agricultural College was successful in developing rust-resistant strains which eliminated this hazard. The water supply is always an important factor in any community, and it is vital for a farmer. For the horses and cattle Gopher Creek, a winding stream, meandered across our farm. At flood in the spring but smaller and more sluggish during the summer, it provided an abundance of water, but in the winter it froze to the bottom and the stock had to walk nearly a mile across the fields to the third crossing of the White Mud River. My father had difficulty in finding a satisfactory supply of well water for drinking and house use. Somewhat reluctantly he engaged a divining-rod well prospector and to the surprise of all of us, this itinerant located a well not far from the house which proved quite satisfactory for our needs. I can still see him with the forked bit of willow moving about the property. The test was positive when a rotatory movement of the sunken willow branch became appropriately pronounced. As the children of the family came to school age, there was the problem of the one and a half miles to be travelled to the school in Gladstone and the same distance home again. This was solved in the usual way of de-pending on “Shank’s Mare.” This posed no particular difficulty during the summer months, but in the winter the cold snow and blizzards required special consideration. To meet this need my mother arranged with Mrs. Desmarais, whose husband Tom was chief of the Sandy Bay Cree Indian Tribe, to make moccasins for us all. Fur caps, fur mitts and coat collars, with warm clothes were our standard garb. Mrs. Desmarais and her associates used dog fur in completing the outfit. We would start out for school, plodding along the winding cattle trail to the river and then to avoid the cold winds, we often travelled the rest of the way to Gladstone on the ice of the White Mud River, protected on each bank by Elm, Maple, Ash, and Oak trees and an undergrowth of shrubs. Our instructions from home were to stay in the school should a blizzard blow up, until my father or one of his men would come for us in horse and cutter. What a comforting cozy sensation to snuggle down in the cutter under the warm robes and let the gusting snow and wind rush by. As we grew older we were expected to hoof it home even in fairly stormy weather as we were always warmly clad. As the sons grew older they had to participate in seasonal work on the farm which meant intermittent school attendance. Usually there was enough hay accumulated in and around the barns and cattle sheds to carry the stock to mid January, but about this time we had to draw it from the Big Grass Marsh stacks to which I have already referred, and this meant an absence of perhaps a few weeks from school. The next school recess was spring seeding after which we might get a month back to school before the July 1st summer holiday began. We were unable to go back to school in the Fall until the harvest was completed including threshing and the fall plowing had to be done. This came to an end at freeze-up  then back to school again until January. The wonder is that we were able to complete our high school standing and in turn proceed to university in Winnipeg, and higher seats of learning. Family picture taken in 1906. 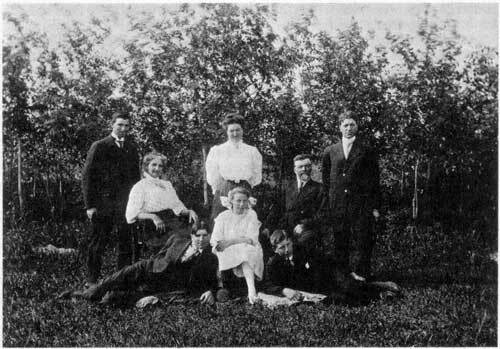 Left to right: standing, Roy, Madeline, Gordon; seated, Priscilla (mother), Marguerite, Chris (father); front, Stanley and Walter. My older sister, Madeline, after attending Havergal Ladies’ College entered the Minneapolis City Hospital Nursing School from which she graduated. My older brother, Roy, in 1903 enrolled in Wesley College from which he later graduated in Arts with his degree of B.A. He spent the rest of his life in the editing of newspapers. I, the third in the family, went on into Medicine. Stanley, just younger than I, attended Wesley College, later took up law and after sitting on the bench for many years in Manitoba, has recently retired. My youngest brother, Walter, also attended Wesley College and although he did not complete his University course, he developed into a highly respected authority as a diesel Engineer. My sister, Marguerite, the youngest of the family, also attended Wesley College, and later took the Carnegie Librarian degree course in Pittsburgh, U.S.A. She had made a contribution in organizing librarian services both in Portland, Oregon, and Victoria, B.C., before her untimely death from Nephritis in 1922. So it was ordained that although we were all brought up on a farm and thoroughly indoctrinated in the art of farming, cattle ranching, and horsemanship, none of us elected to perpetuate our father’s calling. The opportunity of land with clear title, cattle and horses was there, but from the time we moved into higher education our interest in the farm waned. My father did not resent this development nor did my mother; on the contrary, I think they were happy that we had chosen our respective fields of effort. During these later years, my father suffered a “stroke,” which left him with only partial use of one arm and leg. As he had always been so active and energetic this enforced inactivity made him unhappy and he decided to get out of his mixed farming interests. In the meantime he developed a circulatory deterioration. This atheroma and arteriosclerosis was of course of slow development. It was however the cause of irregular heart action (auricular fibrillation) which developed into congestive heart failure with its accompanying shortness of breath and easy fatigue. In 1912 he and my mother retired in Victoria to the Fernwood Road home he paid for by trading in his Okanagan property, as I have already mentioned. He returned to Manitoba each year to look us up and to look over the gradual liquidation of his holdings. While in Winnipeg on one of these visits in the spring of 1915 he seemed quite short of breath and when I met him at the C.P.R. station I was shocked to see how he had failed. I immediately took him to the General Hospital and admitted him under Dr. Charles Hunter, one of our senior internists. Under rest and medication he improved considerably. He went back to Victoria by train and I had arranged for him to be under the care of a responsible physician. The second week in September my mother telephoned that he was in poor condition in hospital and his physician confirmed this. My brother Stanley, and I, took the next train for Victoria. We went to see him in St. Joseph’s Hospital but he was unconscious and died during the night, September 15th, 1915, at the age of sixty-seven. My mother continued to live in Victoria until my sister Marguerite passed on, after which she moved to Vancouver where my youngest brother worked. She enjoyed good health, loved to work in her garden, and radiated happiness and encouragement to her many friends. She died in August, 1946, in the Vancouver General Hospital at the age of eighty-five. She had requested that she be laid to rest beside our father in the cemetery of the town of Gladstone, Manitoba. This seemed a fitting finale for a pioneer couple that had labored and loved it, in the interest of the community in its early formative days.